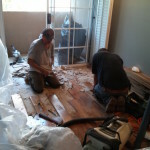 When you buy a hardwood flooring, or engineered hardwood flooring system for your home, the flooring retailer will tell you with the tone of a stern and dire warning that in order for the warranty to be valid and effective on your floor, you have to glue it to the concrete or plywood subfloor with a special moisture barrier adhesive. 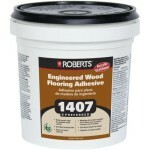 This means that instead of buying a very inexpensive roll of foam, like the vapor barrier thin foam underlay you may have just removed from under your old cheap laminate floor, you have to spread out a very high-priced adhesive that costs as much per square foot as the flooring, or more. And then you will have your warranty, but when is the last time you heard of a poorly manufactured floor becoming defective and being replaced by the manufacturer? And who do you think pays for the removal of the old floor and the re-installation of the replacement flooring that the manufacture will supposedly provide? The glue is their way of tripling your costs and making it really hard to remove the floor down the road. Let’s say your water heater bursts and floods your living space, and then your fine new floor warps and bubbles from it’s soaking. Well when you go to remove it, it comes off the glue layer, not as the original complete planks that you had laid, but as tiny splinters. It is a massive job and many hours of labor to scrape it all up. So is there an alternative? Yes, just ignore the so-called warranty, that no-one has ever used in the history of civilization, and don’t buy the glue. Roll out the same thin foam you would put under your two buck laminate, and when the time comes to replace a damaged plank, you can just start at the nearest wall and take apart the tongue and groove until you reach your spot and then put the same old planks back down after replacing the one damaged area. Locking planks have a tongue and groove edge system and can be considered a do-it-yourself product because nails, staples, and glue are not required. All you have to do is roll out the moisture barrier underlayment for moisture protection and then float the floor over the subfloor by locking the planks together. If the box says use glue, nails, staples etc. Ignore it! Don’t even read the warranty. No-one is going to come in and steal your floor, but if you yourself need to uninstall some or all of it, you can, as long as you didn’t glue it down. Yes this has happened, does happen and will continue to happen. Just say no to the glue.